Hi friends! I have your next meal right herrrrrre. I will admit that I didn’t JUST make this risotto. I’ve started a new annual tradition where I make risotto on New Year’s Day, so this is what I made on the first day of 2019! Since then, I’ve packed up all the crap in my apartment (and there was oh-so-much crap!) and moved to a new place. Don’t worry - I still live in Hoboken, but I’m finally getting the chance to come up for air after all these “fun” moving obligations are over. There are still pictures to hang, but for the most part, everything is done. I also cooked my first meal tonight in the new place. I’m working on a recipe for some lamb chops for you guys, but there’s always some reason to rush through and I don’t get a chance to measure out the spices…so there’s that. While we wait for those lamb chops, I present this risotto to you! I’m in love with it. I’ve always loved risotto, but I actually stopped making it for about a year. I have a really bad habit of dropping recipes that don’t work for me. It doesn’t matter that I’ve made a certain recipe a bunch of times before. The one time that I make it and it’s not so good….I’m done for a while. I’m working to try to change this, but it’s a tough habit to break! This recipe turned out to be really amazing though. Surprisingly, I don’t think I’ve ever made sauteed mushrooms and spinach before and I’m not quite sure why. This is clearly a superior recipe and the butter and garlic in this part of the dish don’t hurt at all. I had extra mushrooms and spinach left over and I confess that I made the vegetables sans risotto a few days later just so that I could eat it again. It was so so good! So anyway, I’m working on making a few new recipes to share with you guys and I can’t wait to get back into some sort of routine over here! See you soon, but in the meantime, I beg you to make this risotto because you won’t regret it! 1) In a medium pot, heat up the chicken broth until it reaches a gentle simmer. 2) Heat 2 tablespoons of butter in a large saucepan over medium high heat. 3) Add 2 cloves of garlic to the pan and saute for 1-2 minutes. 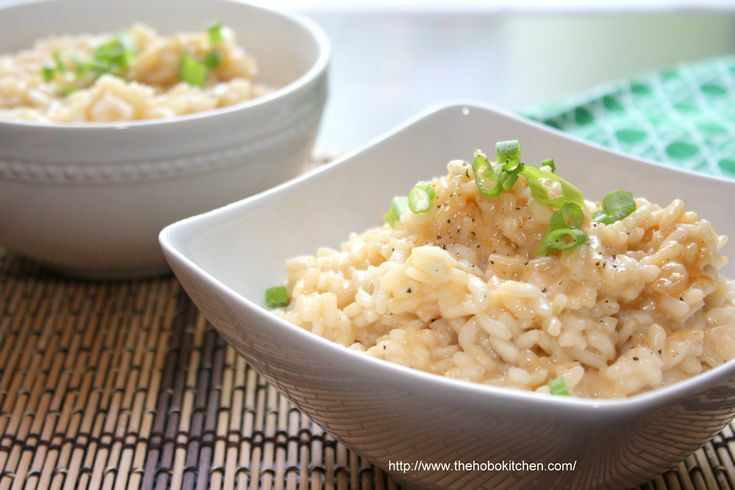 4) Pour in the arborio rice and toss the grains in the butter and garlic for another 1-2 minutes. If using white wine, pour the wine into the pan now. 5) Next, pour in 1 cup of the warmed chicken broth. Stir the rice and broth gently, until most of the liquid has evaporated. This could take a few minutes. Then add another 1/2 cup of chicken broth and repeat the process until the rice is tender and creamy. 6) In another saucepan, melt the remaining 2 tablespoons of butter over medium high heat. Add the remaining 2 cloves of garlic and saute for 1-2 minutes, or until warmed through and fragrant. 7) Add in the sliced mushrooms and saute for 5-10 minutes. You might also wish to add a splash of white wine here. Once the mushrooms are cooked through to your liking, remove from heat and stir in the spinach until wilted. 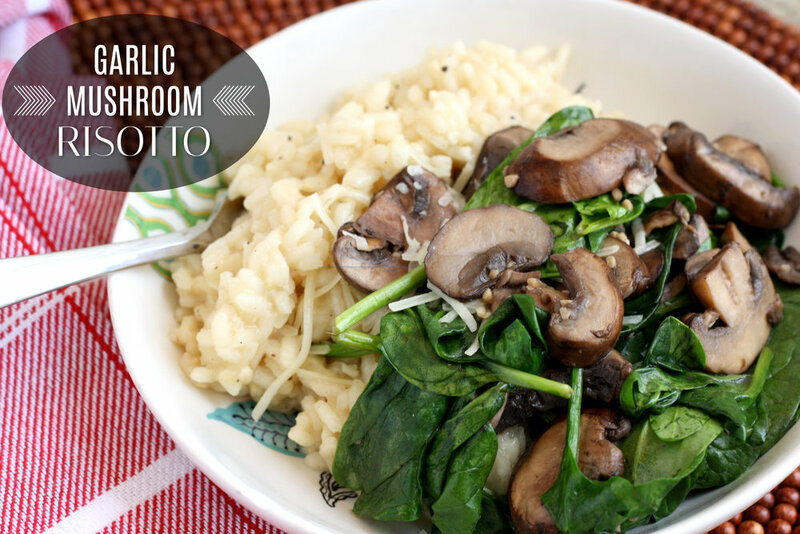 8) Plate the risotto, then top with the mushroom and spinach mixture. Sprinkle generously with the Parmesan cheese, salt, pepper, and an extra squeeze of lemon if desired. If you are still on the market for a side dish, I've got you covered! 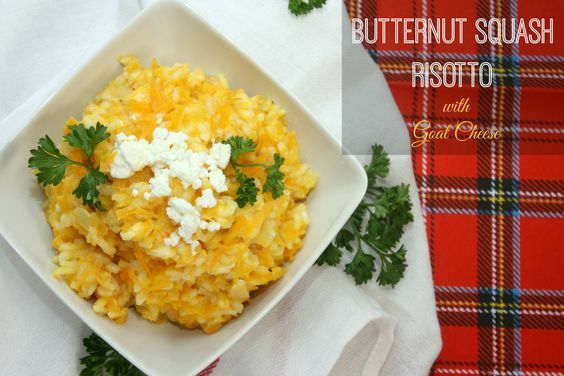 I present to you...the Butternut Squash Risotto with Goat Cheese! Now, if you are not one of those people that keeps ingredients around so you can make risotto, you can still make this after Thanksgiving and I won't tell a soul. If you, like me, always have arborio rice and goat cheese on hand, then let's talk. Since Fall began, I've been super extra with making pumpkin/butternut squash/spiced things. I just can't get enough this season and I'm not letting it go just yet. This particular recipe doesn't call for a ton of ingredients which is excellent because I like to spend my free time eating. Less talk, more action. This recipe does require some babysitting, but you can stir the risotto periodically as you wait for the rice to absorb the liquid. I find that I like to taste test glasses of wine while I wait. But you can do whatever you like. No judgements here. So make sure you don't leave out this amazing option for your Thanksgiving feast. And hey, if it's too late to add this to your table, I still suggest preparing it before winter is over! Full confession - I should have definitely posted this recipe days ago! Last week I started to come down with a cold. Usually I can tough it out, but this one really knocked me down. To add insult to injury, I lost my voice a week ago on Friday. It's coming back slowly, but I originally thought it would come back in just a few days. Now it's been over a week and I've still got a raspy thing going. To give you an indication of how bad this was, I had a call with my boss last week and she thought I was the male person who was also on the call. Sooo....nailed it! And cue this blog post getting pushed out to today. Anyhow, I made this risotto recently and it has been the perfect thing to help with this sickness. I also realized that I've really been neglecting my risotto recipes! I haven't made any since January of this year. Did you hear that? Jan-u-ary! 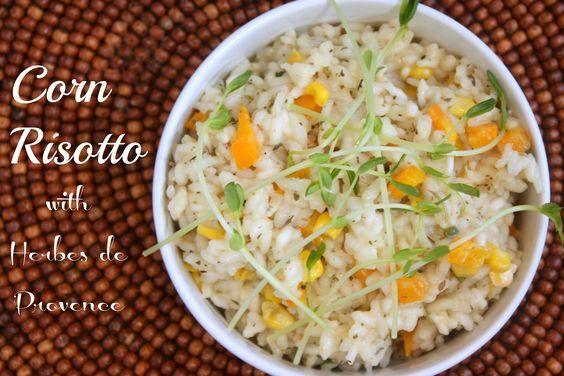 It's really one of my favorite dishes but the arborio rice has just been sitting in my pantry for a while. Not anymore! In addition to cleaning out the pantry (one of my favorite/least favorite things to do), I also wanted to incorporate corn into the mix. Because who doesn't love corn? Another incentive to make this was that I picked up some Herbes de Provence a few weeks ago at a street fair in Hoboken. I originally tried Herbes de Provence while I was in Provence on a school trip ages ago. I fell in love with it then and I've bought it since, but I hadn't replenished my stash in a while. When I saw a vendor selling it, I doubled down! Now, we've got risotto, corn, AND Herbes de Provence all in one dish. THIS is how you kick a cold and kickstart a new week! Cheers for the first post of 2016! What's everyone's resolutions for the new year? I've been trying to eat healthier for the past few months so I'm sort of bringing that resolution with me into 2016. I technically need to start over though because the past week has been a massive fail. Yikes! In the last few years, I've tried to do the typical thing and post a healthy recipe as my first post of the year. However, seeing as I inhaled a chocolate chip brownie and 3 insomnia cookies after eating Chinese food on New Years Day, maybe I'm not the one to be giving out health advice. But what I can tell you about is this risotto. This may not be the healthiest dish, but it is really tasty and and pretty quick to make. Let's face it, even though the holidays are over, our lives are still hectic. I know many people think that it takes a while to make risotto but this is completely false. This isn't a "set it and forget it" meal, but it isn't complicated either. 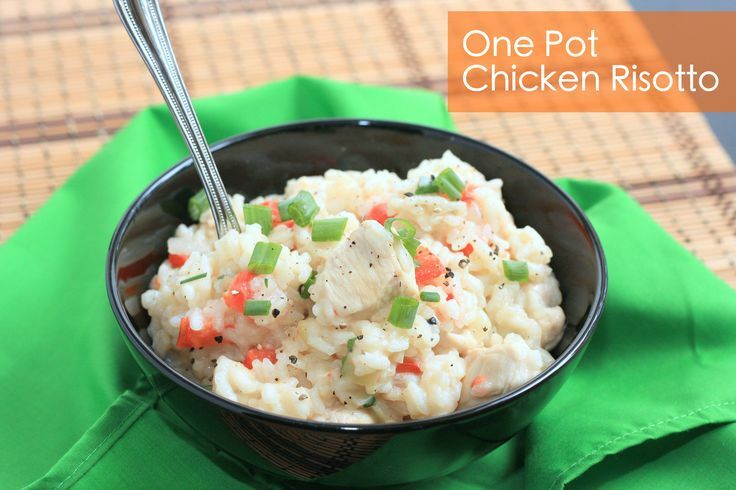 Give it a shot and I promise you that creamy chicken risotto can also be a part of your immediate future. For this month's Secret Recipe Club, I was matched up with Sarah from Sarah's Kitchen. Sarah is a non-American (like myself!) and has been living in the US since 2002. I'm so excited that I was assigned her blog this month since I feel as if our tastes are pretty similar. Most of her recipes jumped out at me from the start! I have to give honorable mentions to several recipes that I really, really (no, like really) wanted to make: Chili Con Queso Pasta Bake, Chile Rellenos Casserole, and Lemon-Garlic Shrimp and Grits. (Shrimp and grits is definitely on List #1 and potentially also on List #3.) Out of all these, though, the Beer and Cheddar Risotto won out. I cannot tell you how excited I was to make this. It was also worth the wait. Risotto is one of my favorite dishes and if we just add beer and cheese, I'm pretty sure that makes this the most perfect dish ever. I'm probably in the minority when I say that I think risotto is one of the easiest things to make. I feel as if I overlook it so often in my attempt to whip up other dishes or treats that I feel I haven't "done" yet. Risotto is simple and delicious and cheesy and I-just-need-to-reach-for-that-darn-box! When I opened the cupboard door for the umpteenth time and saw the risotto again, I finally decided that it was time for action. Even though I have an endless list of risotto recipes bookmarked online and torn out of magazines, I had recently been assigned Heather's blog, Join Us, Pull Up A Chair, this month's Secret Recipe Club. There are so many tasty recipes on this site that you really must do yourself a favor and check it out! While I tried to give each recipe a fair shot at being "the one" for this month, I have to say that I definitely honed in on the Baked Sausage and Mushroom Risotto recipe. Come on! You know I feel some kind of way about sausage. Once we add in the mushrooms, cheese, and risotto, this was a clear winner in my eyes. Another disclaimer here: I didn't bake the risotto like the original recipe recommended. I wanted to, but I ran out of time and just quickly finished it on the stovetop. I did use all the ingredients though, so I'm about 100% sure the taste was spot on, which is a good thing because this risotto was insanely delicious! All I can say is that you must give this is a shot if you even only halfway love this combination of ingredients. Don't walk to your kitchen. Run! So. Pretty much the above paragraph is all I wrote while watching a 2-hour presentation of The Bible. In order to get some writing done, I had to switch to Worst Cooks In America. There's a show that makes me ecstatic to have picked up cooking so easily and so quickly. In all honesty, when I moved to Hoboken a few (ahem...several) years ago, I had an idea how to cook maybe 3 things. Which naturally meant that the first new recipe I decided to teach myself was...risotto. Yeah, totally went big on that one. I made a butternut squash risotto that was delicious, if I may toot my own horn. Which I will. I was actually pleasantly surprised by the outcome and was encouraged to expand my cooking horizons, if you will. Recently, I stumbled across a Giada recipe for red wine risotto. Wha...? You know I love me some red wine. And then I realized she also put peas in the recipe. I love me some peas too! And as icing on the cake, I didn't have to buy anything for this recipe since I obviously had red wine and peas at the ready. I have been making (and sometimes eating!) a ton of snacks and desserts over the past month or so. So this week, I decided I would be a real person and cook some real food. To push myself even further, I decided to tackle something new. For this month's Secret Recipe Club assignment, I was paired up with Corina's Searching for Spice blog. Can I say that this blog excites me? Is that going to far? Great. I didn't think so either. I love spices and anything remotely related to ethnic food, so this blog was a perfect match. I can't believe how many recipes I want to try. I don't even have enough time to talk about it all. Check it out for yourself! One of Corina's dishes immediately caught my attention. Paella. For some reason, I have never had paella before. I don't know why but this should be fixed immediately. Now I know in my heart of hearts that I will most likely not recreate the full authentic flavors of Spain since I don't have the exact rice and I don't have all the correct spices. However, that doesn't mean that I can't still make a mean pot of flavorful rice. I had to give this recipe a shot. 1) Drizzle 1-2 tablespoons olive oil into a wide pan, over medium heat. 2) Add the chicken to the pan and saute briefly, until white on all sides. Remove the chicken from the pan and set aside for later. 3) Put the onion and garlic into the same pan and fry until softened, ~2 minutes. 4) Add the chorizo and saute for another 1-2 minutes, until the chorizo begins to cook and release its oil. 5) Toss in the tomatoes, red pepper and green beans. 6) Put the chicken back in the pan and add the spices and habanero sauce. 7) Pour the rice into the pan and cook for 1-2 minutes, stirring to combine. 8) Cover the paella with the beer. If it isn't fully covered, add more beer or water until just covered. The rice turned out to be quite flavorful and spicy. Because of the different cooking method, the arborio rice wasn't as creamy as it would be in a risotto, but that's sort of the point here! I loved the combination of the vegetables paired with the chicken and the chorizo. Since I didn't have any saffron on hand, the addition of turmeric substituted nicely. The spice was then amped up even more with the addition of the habanero sauce. I don't mind this at all and I think it fit in perfectly with the spirit of the dish. Corina was definitely on to something with this recipe and I'm looking forward to making it again. If you don't mind, I'd like to continue along my current theme of comfort foods. That's allowed, right? Regardless of the fact that it's only been arctic cold for about 5 days out of the past 30 or so, I am always ready to whip up rich and creamy dishes at the drop of a hat. This particular recipe was initially born out of my love of goat cheese and my discovery of a package of frozen peas. This is the truth. However, my desire to bathe my face in warm goat cheese and risotto is really what lit a fire under my "you know what". As I strongly suspected, this risotto was fabulous. It was creamy. It was goat-cheesy. It was good for you (hello, peas are vegetables). It was warm and satisfying in my belly.